650 muscles support the skeletal system of the body. These muscles make everything you do possible, every movement, from running a 5k to blinking your eyes. When growing your muscles you are also exhausting your muscles. The body then repairs these tired muscle fibers and creates new muscle mass, or myofibrils. This process of repair happens when at rest and this cycle is very important to the building of lean muscle mass and overall strength training results. Muscle growth while you are in motion takes place by satellite cells, which allow muscle cells to possess more nuclei that stimulate the direct growth of myofibrils. Your muscles are growing while you are at work, and also while you are at rest. What determines the mass of muscles is determined by your training routine and diet. Lean muscle mass is important for both men and women as it promotes healthy weight management by boosting metabolism and burning more fat while the body is at rest and for good health. According to the American Council on Exercise, after the age of 20, the human body loses about 1/2 a pound of muscle each year. Muscle loss means increases in body fat and loss of strength for everyday activities. This becomes even more detrimental in the senior years. Building muscle can help manage chronic disease. It also helps with chronic joint conditions, and related pain such as that found in rheumatoid arthritis. It can help back pain, diabetes, and obesity. Lean muscle mass helps to build bone density and improve symptoms of osteoporosis. The Centers for Disease Control and Prevention recommend that everyone take part in at least two strength-training sessions each week in support of lean muscle mass. The workout should be well rounded and include exercises that target every major muscle group. When building lean muscle mass you will usually keep a routine that includes resistance training and cardio. With the right balance of the two programs, and a proper diet—you will gain lean muscle mass. Protein is the building block of muscle, and is required for recovery and growth. 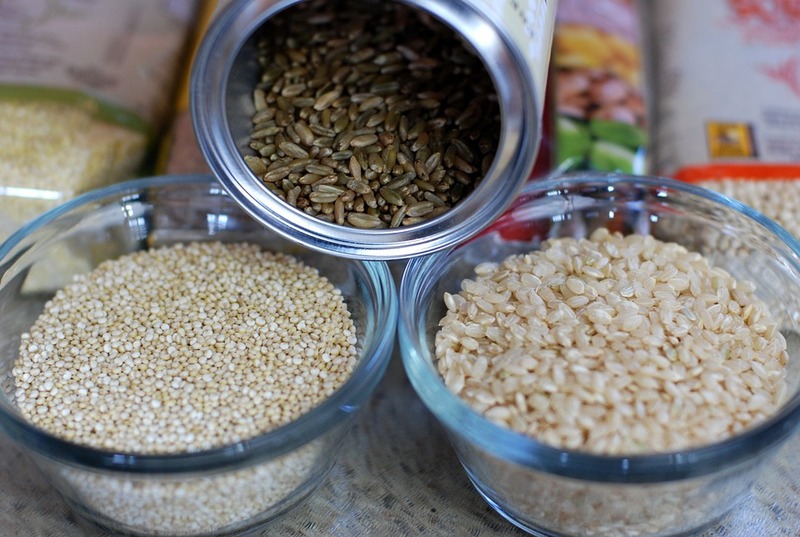 High protein whole grains can be added to a diet to introduce a wholesome source of protein. Use this list of whole grain proteins as you work toward your lean muscle mass goals and to also benefit from all the other nutrients and health benefits that whole grains provide. 1. Wheat germ (not gluten free): This grain is derived from new growth of wheat plants. Wheat germ can be added to any dish for texture or to a smoothie for nutty flavor. One cup of wheat germ has 26.6 grams of protein. The grain also packs vitamin E, zinc, magnesium, folic acid, phosphorous, and more healthful characteristics. 2. Amaranth: This is pseudo-cereal grain that also packs a protein punch with 9 gram of protein in a cup. This grain has been used for thousands of years, and can make for great nutty and peppery flavor in baked goods and other dishes. 3. Oat bran: Milling high protein oats creates this grain. It has nutritional value with 7 grams of protein per cup. One of the most popular uses is for hot cereal in the morning. You can jazz up your hot cereal with honey, fruit, nuts, chia seeds, and/or other toppings of your choice. 4. Quinoa: With over 8 grams of protein in a cup and versatile flavor, quinoa is a popular and powerful grain. It is also rich in lysine, iron, magnesium, and more. Quinoa is seed with a mild and nutty flavor. Although it tastes like rice, it is more closely related to kale. 5. Khorasan (not gluten free): This type of wheat variety has close to 11 grams of protein per cup. It has nutrients like selenium and magnesium. It has been tested and proven to be high in antioxidants. 6. Wild rice: With 7 grams of protein in a cup of wild rice, this can be a more palatable way picky eaters can consume high protein whole grains. Wild rice also has nutritional qualities like folic acid and vitamin B. What Nutrients Support Lean Muscle Mass? · Vitamin C is proven to support oxygen and nutritional needs of muscles. It is also a key in collagen, bones, and muscles. · Vitamin D is a mighty nutrient that plays a huge role in strength, as well as levels of testosterone. · Fish Oil provides the best protection against heart disease and promotes cardiovascular performance. · Vitamin A is an amazing antioxidant that helps eliminate free radicals put off during exercise. · Protein Powder is a super supplement and an easy way to increase levels of protein in meals. Add it to smoothies for a healthy post-workout drink. Now that you have a better understanding of how muscles are formed, and what kind of routine you need to build lean muscle mass, you are better able to create a meal plan. You should always be sure to include high protein whole grains in your diet to fuel your workouts and your life. Need some help creating a meal plan or formulating a fitness routine? Take a look at the BODY SHOP for the perfect program for you!